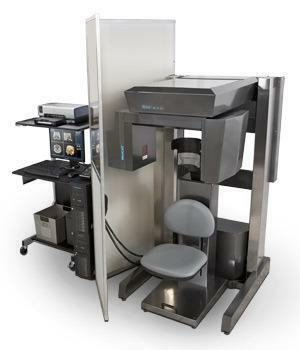 The Xoran MiniCAT™ is a compact, upright volume computed tomography system designed for high-resolution bone window imaging of the sinuses, temporal bones, and skull base. MiniCAT™ provides immediate access to images resulting in faster diagnosis and treatment. The Xoran MiniCAT™ scanner is an in-office CT scanner that offers a variety of advantages over traditional scanning. These include high-resolution images with three-dimensional reconstructions. The sinuses, ears, facial bones, temporal bones, and TMJs can be displayed clearly and in various views. Additionally, the CT has significantly lower radiation exposure (1/8th the dose!) than traditional CT scans. With increasing concerns about lifetime radiation exposure, this is a critical advantage over traditional imaging. Patients are able to sit comfortably without having to flex or extend their necks into difficult positions. An in-office CT scan takes only 10-20 seconds depending on the type of scan ordered for the patient. The data from the scan can be saved to a CD, DVD, or memory stick. The Xoran software makes it easy to print images and reports for patients and requesting physicians. With the Xoran MiniCAT™ we can effectively view the anatomy of the sinuses. The human head contains 4 pairs of sinuses (8 total), which are connected by nasal passages. The frontal sinuses are in the forehead, the maxillary sinuses are behind the cheekbones, the ethmoid sinuses are between the eyes, and the sphenoid sinuses are behind the eyes. Your doctor may order a CT scan of the sinuses for a patient who has chronic sinusitis or allergies in order to properly diagnose and treat the issue with immediate scan results. For more information about how we do CT scans and our other services including ear neck and throat specialist, Dr. Robert Pettis and more, please call our office at (949) 715-0500. For more information about the Xoran MiniCAT™, please visit www.xorantech.com.